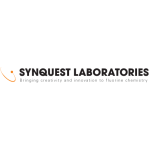 Welcome to the SynQuest Laboratories Research Chemical web site, now listing over 5000 fluorochemicals. Currently enjoying our 17th year of business, SynQuest maintains focus on fluorine chemistry, as well as extending our range of reagents with new materials requested by our customers and from our internal R&D programs for the development of new products. We have implemented cost savings by careful sourcing of raw materials and by scaling up processes for better economy of scale - our efforts have resulted in significant price reductions for many products! SynQuest has expanded our manufacturing facilities to include a continuous flow production area, mainly for gas phase reactions, and a second high pressure area for autoclaves. We have also invested in a process development lab, and completely renovated our R&D laboratories. Our commitment to product quality was demonstrated with our new analytical laboratory, which opened last year. Our fully independent QA/QC department is well equipped with a comprehensive range of analytical equipment. To supplement our manufacturing capabilities and help keep production costs down SynQuest sources products and raw materials from all over the world. We've opened a SynQuest office in Shanghai and our staff there has helped us establish a select group of reliable chemical manufacturers for supply of raw materials and out-sourcing of finished goods. However, unlike simple traders, we carefully analyze all incoming goods and provide certificates of analysis developed in our own analytical facilities. We are routinely in touch with fluorine chemists in Japan, Europe, Russia and China. If you can't see what you are looking for in our catalog, then give us a call. We know where to find literally thousands of other fluorinated materials and if we don't know of a source, we may be able to offer custom synthesis services. In 2008, Central Glass acquired Apollo Scientific Ltd., in the UK. We have worked closely with Apollo for many years, including a reciprocal distribution arrangement since 1996. Apollo offers a comprehensive range of fluorochemicals and also many non-fluorinated intermediates and reagents for R&D laboratories. To accommodate this vastly increased product line we have increased our catalog and bulk warehousing to 30,000 square feet. In 2009 Central Glass acquired a world-class GMP manufacturing facility in Germany, where advanced pharmaceutical intermediates and active pharmaceutical ingredients are manufactured. We can offer development of GMP processes from lab bench to large scale production at Central Glass Germany. At SynQuest we recognize that a research chemicals catalog business is a service industry. Our aim is to provide first class service by responding quickly to your inquiries, offering competitive prices, many unique products, timely shipments, and by providing competent technical support.